If you've been following Two It Yourself regularly you know I love a good knockoff - especially when it's a Pottery Barn one and especially when it saves me oh...$129! 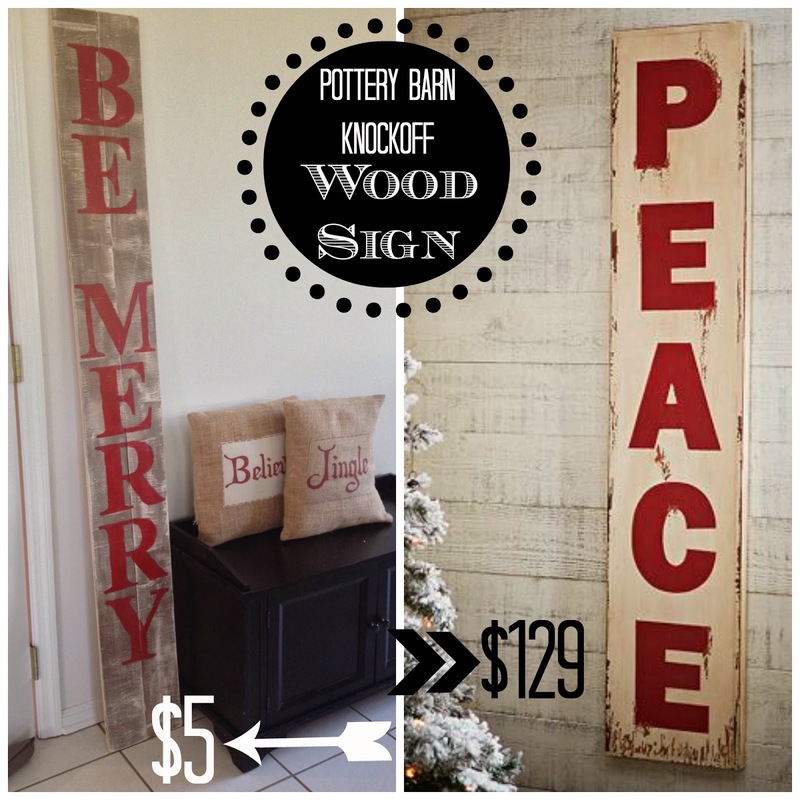 I kid you not, this 54" Pottery Barn Peace Sign - as gorgeously hand painted as it is - is triple digits. Well, guess what my friends....I just made a DIY large Christmas sign for FREE! (Even if you don't have any supplies you can make this for just a few bucks...for the paint and stain.) I may be bias, but I think my DIY version is equally as charming. As much as I love me some PB, I decided to use the sign as inspiration, but not completely knock it off. Instead of PEACE I went with BE MERRY and I have a different finish. That's what's great about this large wood Christmas sign - it's completely customizable. I started by taking apart a large pallet that I had on hand (thanks to the delivery of our 6' long double vanity). I told you I was equally as excited about that pallet, as I was the actually vanity! I removed the cross sections of wood (and used them for my DIY wood box centerpiece) and used just the two long pieces which were already equal lengths at 72 inches. Then I used three smaller pieces of scrap wood to hold the large pieces together across the back. It's not pretty, but no one's seeing this side so that's a-ok with me! 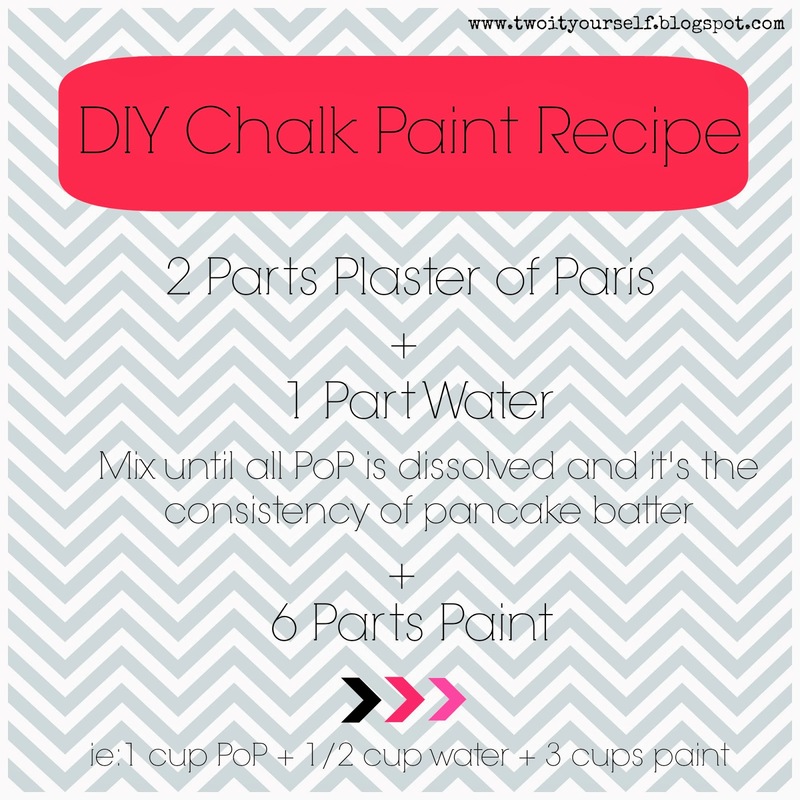 To get this finish I first painted two coats of white DIY chalk paint (recipe here) which I had leftover from my TV cabinet makeover. Are you noticing a theme here? I LOVE to use what I have on hand. After the paint was dry I used a rag to rub on a coat of MiniWax stain in Dark Walnut. Stain over paint is one of my favorite tricks. The point here is NOT to have the stain absorbed into the wood, like you would traditionally use stain. What you're going after is to give the finished piece an aged look and add some character. After a few minutes of letting the stain sit on the paint, I used a clean rag to wipe off the stain. You can see - in the picture on the right - some of the stain is left behind and it gives this beautiful grayish finish. Once the stain was dry, I sanded it to distress the sign so the white paint would show throw in some places. Okay, now it's time for the fun part - adding the typography. There are various ways to add font to wood as you can see here and here...this time I went with the simple stencil technique since I would be tracing individual letters rather than scripted words. I fooled around in MS Word for awhile to get the font size right for my large sign. You'll want to pick a size that will fill the sign so the letters don't look lost. Print one letter out hold it up to the sign before you print out the whole word and realize it's the wrong size. 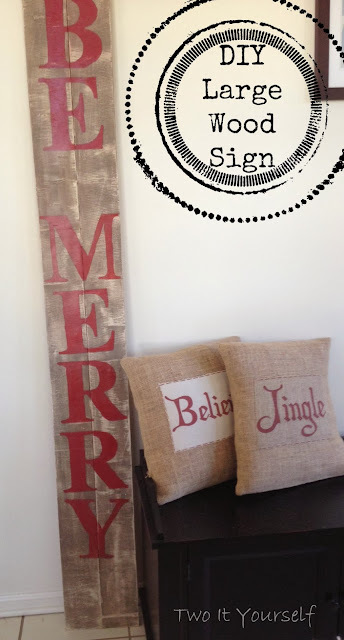 I plan to put my "Be Merry" sign on my front porch during the holiday season so I wanted it to be legible from the road aka LARGE! For that reason I went with the simple and classic Times New Roman front in size 750. TIP: To save on ink print JUST the outline of each letter. Also if you have repeat letters such as E and R, there's no need to print - or cut - them twice. Once all your letters are printed, cut them out. These are going to be your stencils. Line them up on your sign and get the spacing how you like it. I used a tape measure and spaced 1" between each letter. Working with one letter at a time, spray a light coat of spray adhesive on the back of the letter and lightly press all edges down onto the wood sign. Use a black colored pencil or a pen and trace around the letter. Peel up the stencil and repeat with all of your letters. After all my letters were outlined in pencil, I used a dark red craft paint to fill in the letters with a small paint brush. Once the letters were dry I lightly sanded them so they didn't look so 'fresh' and new. Then I finished off the whole sign with a coat of spray polyurethane. And one more picture of my oversized wood Christmas sign just so you can see the full size...(and my cute little helper elf).